Most of our fast food is filled with salt and saturated fat, and lacking in vital nutrients. That’s why eating fast food on a regular basis has been linked to medical conditions such as high blood pressure, high cholesterol, obesity, diabetes, etc. A super-size container of fries and a burger washed down with a large soft drink might be comfortably filling, but that kind of diet is not doing anything positive for our bodies (and that is an understatement). Sadly, other animals around us are also getting addicted to our sugary, salty, greasy fast food. In Hawaii, there are countless outdoor eating areas because the weather is so beautiful. Sitting around in the grass underneath the tables, there are a lot of obese pigeons waiting for handouts (or accidental spills). Their diet is composed primarily of leftover fries, onion rings, chips, and pieces of bread. These poor pigeons have gotten so fat that, when they do attempt to fly, they can only go a few feet before plopping back down onto the ground in exhaustion. Truthfully, I think these birds are attracted to fast food for the same reasons that people are—it’s convenient, easy to get, and its filling. Really? Maybe the humans who created this greasy, salty, deleterious version of food also think that there are too many people in the world. 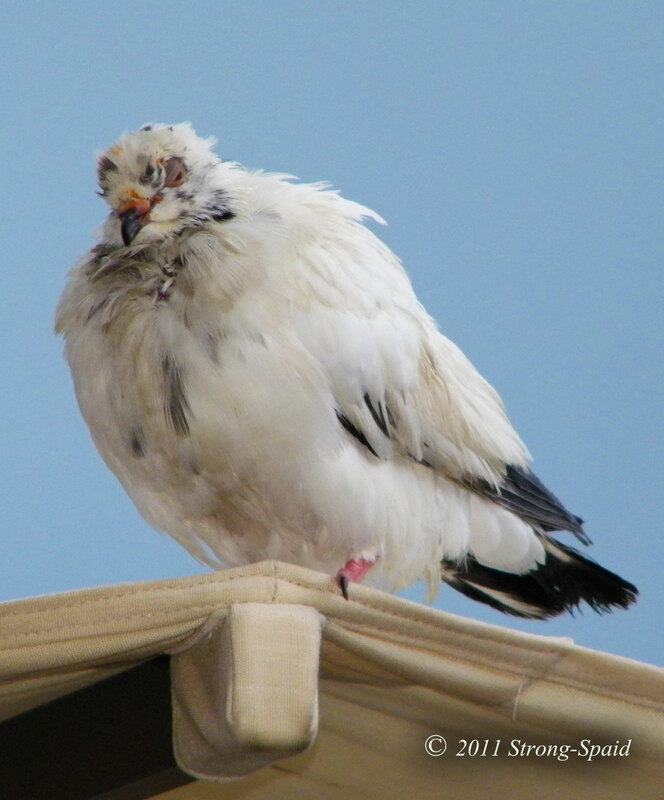 This entry was posted in Nutrition, photography and tagged birds, diabetes, fat, high cholesterol, obesity. Bookmark the permalink. I really like this post! I have just recommended it on Martins blog, he is writing a serial on pidgeons. Only in german, I’m afraid. Because I sing opera, I do sing in German from time to time. I have Cassells German/English dictionary, and I am always looking up words to find out their meanings. It is very interesting! I am going to sign up for a class and learn more. I envy you from the deepest bottom of my heart … you sing opera???? Gorgeous, I LOVE opera. I’m totally without a singintalent, I’ afraid. Sigh. That’s life. you know may be they really think this way when they make these deadly foods for human beings. Yes, I do wonder about some of these “deadly pleasures.” Not just fast food–consider cigarettes also. A few years ago, I heard a radio interview with an executive from Phillip Morris (big tobacco company). He was asked if he felt guilty about the health care costs of people who were sick and dying from smoking cigarettes—he said NO. He said it all evens out. He told the interviewer to think about all of the money that the government is saving on social security and Medicare–because smokers usually don’t live to be very old. After the executive from Phillip Morris said that…..there was a gasp and dead silence for a few moments. But, he did say that. And there are other articles online that basically suggest the same thing. Wow! What an eye opener! Thanks for sharing that! Poor bird:-( time we all wake up. I know! The birds who are too heavy to fly anymore are trying to tell us something, for sure.